On my way home. Photo by Ahhfred. I’m sure I raised an eyebrow. Couples at other tables ate pasta and sipped wine. There was no dessert menu? I paused expectantly. He stared at me in silence. He ran off to get it and I tried not to laugh. His suit and vest, his perfect poise, the wood paneling and ancient bar: his attitude didn’t seem to match the place. I had just come in looking for a snack on the way home, but I wasn’t sure I was going to get it. He dropped off the menu and upon opening it I found myself staring at a section in giant letters: DESSERTS. Okay, I thought, Two can play at the Mexican passive-aggressive game. He came back and asked what I would like. I pointed. A short discussion later, he had conceded that the restaurant did, in fact, serve sugar. He pretended he had misheard me; I pretended I believed him. I already knew the next trick in the repertoire. “This flan,” I said. “Do you have that today?” I don’t actually like flan. I acted disappointed, and hemmed and hawed over my backup choice. “Well… give me the chocolate roll cake, I guess.” I adore chocolate. Like a high school sweetheart, no waiter can play hard to get forever. The gentleman did eventually bring me my cake, and I eventually left him his tip. Just another routine transaction in Mexico. I came to this country partly to write, partly to learn Spanish, and partly just to figure things out. My time here is almost over, and of those three plans not a single one is finished. But I’ve had enough desert towns for a while. I spent my first two months in San Luis Potosí where the main road to the Centro runs perfectly east-west and never has a shady side. 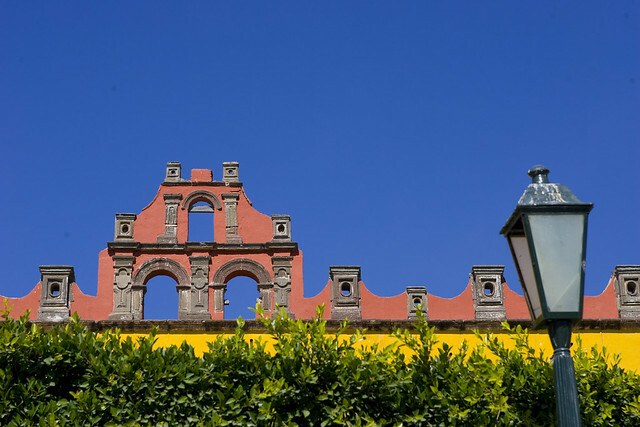 The last two months have been here in Guanajuato, a gorgeous colonial town surrounded by less gorgeous town town. The evening thunderstorms bring much needed cool air but also send scorpions fleeing into my apartment in search of the high ground. They’re cute, and almost never deadly—although I haven’t put it to the test. Adventurer though I am, I’ve spent most of these days quietly at home typing at the computer. I caught up on old travel logs, finished short stories, and plotted a new fiction series set in medieval Spain. I guess you could say I got into a groove. In one week, that groove will end. The promise I make people is this: if you don’t know your purpose in life, travel. Travel and you will find it. Purpose, of course, means many different things. It’s not assigned to you by the gods, not stamped on your soul by karma, not woven by the fates. Those are very beautiful ideas from people who aren’t quite sure how you find a purpose. To them, it seems very mysterious. But my hope was that a purpose can be found somewhere in the space between what you enjoy and what you’re good at, and seen most clearly when you strip away all the familiar voices that keep you locked into your routine. In other words, get out of your home and go somewhere so far away that you know no one—not even yourself. Getting lost is a pretty good start to getting found. But that was just a theory. Imagine my surprise when it worked. I’ve charted maybe 2,500 miles by bicycle, a hundred more by kayak, and who knows how many jetting, busing and driving from country to country. I’ve always traveled filled with a million conflicting dreams: to be an academic, an artist, a guru, a recluse, a wanderer, a husband, a loner. To live to old age in a house on the beach, to die young in some glorious and flashy way. You just can’t do everything, Rogue Priest. I can do two things, however, and one of those is my life purpose. I didn’t know it setting out, but my journey has taught me that only one thing matters to me: to write. Ask me a year ago, and even if this trip kills me I’d say I’d made my peace with that. But the truth is I have to survive, because I was born with more stories in my head than I’ll ever be able to tell and I damn well intend to tell as many as I can. The other thing is to share the journey with others. This has been my goal from day one. Every time you hear about someone biking from Alaska to Chile, or retracing Marco Polo’s route, or rafting the Amazon River, it’s always one lone guy. Or a couple. At most, a few old buddies. It’s never a group. This is something most of us think we can’t do—we don’t think we have it in us to go on a great soul-changing journey, or that we can afford it or have the time. It’s big and it’s difficult and it sounds like too much. But I think if we go together, it won’t be so hard. That’s why I’m changing the next leg of the Adventure. I need to make it accessible. No one can drop their lives and join me for years, but a lot of people might be able to come for a few days or a week if they have advanced notice. I’m plotting the entire route now, and minimizing time in dangerous areas. Next I’ll break that route into small segments between major stopping points, of about 5 bicycling days each. I will schedule start dates (and estimated finish dates) for each short segment. The first one will likely start in November. I’ll gather information on security, supplies, airports, and how to get a bicycle to Mexico. I’ll make this all available here on the website. People who want to try a short adventure can sign up for any leg they prefer. There is no charge. For the first time in my journey, people will be able to see an itinerary months in advance. That’s because it’s not just my journey anymore, it’s a journey with an open door. Of course, I don’t expect everyone reading this to cycle through Mexico, no matter how accessible it is. I’ll be recruiting through cycling forums and bike groups across the US and Mexico. I want to make it possible for others to experience the thrill of the road, and the sense of self discovery it brings. If you like this idea please consider sharing this post. And how can I make this plan stronger? Leave me a comment with your thoughts, ideas, even your criticism. Every voice helps. My book Lúnasa Days has been called “like Paulo Coelho only darker.” Available in paperback and on Kindle. Maybe some info on how to prepare? I know you said you were open to beginners, but it seems to me some prep could be a part of the whole experience. Maybe a “stuff NOT to bring” section? Is there other stuff I should include that I’m forgetting? That seems like it’ll cover it! I like this change, and I hope this brings more people out. Thank you one million times for sharing!